We are all Africans. Some of us left a little earlier than the others, some of us didn’t leave of our own accord, Some of us remained. As the song goes ‘We Are Family’ and I am one Sister who has a story to share. A story like many others no doubt but one I’m going to tell anyway. This is no time to play small and stay silent. *I am a child of God and my playing small does not serve the world. *Words attributed to Mr Mandela quoting the poet Marianne Williamson. So he’s gone. We knew this day would come, selfishly we can’t stand it. We wanted him to live forever,to keep representing the best of us. To keep giving us the words we need so we can say yeah…what he said. In a leaderless world we follow blindly, when the best of us steps up we follow forever and this particular journey has been resting and has now stopped. It seems like even in his going he took the longer route to help us get used to it. To help us get used to not seeing him, asking him questions, having the right answers. We sat at his feet like nodding Great Grandchildren yes yes we will remember. But will we? To remember is crucial for our future. We must remember together, otherwise the story will start to erode and be told by others in a seemingly insignificantly different way. This way will make such a difference that only generations to come can turn back and tell the truth, and by then it may be too late. It is the difference between war and peace. It is the difference between the lies people can tell on you so well you begin to believe it yourself. We know some of our brothers and sisters were not always followers of this righteous man, some of them called him names and campaigned against the cause. They tried to keep him out of the press. It was the photographers, writers, singers, poets, filmmakers, DJ’S and ‘loony leftie’ councils naming roads, buildings and gardens after him that kept us remembering, as well as the politicians and the people. We watched as these same said brothers and sisters smiled (skin teeth) shook hands, jostled for photographs with him and he took their hands and smiled back and then he spoke his words. For more on what he actually said here is a link to his address to the UK House of Lords. Telling them about themselves and thanking the rest of us. So back to our story. I can’t tell you my tales of freedom fighting with arms, only freedom fighting with words. Like some of us at the time I told my fellow teenage friends about what my parents had told me. Argued in the classroom about Cape grapes, read the books, went to the meetings, the opening of the gardens and attended the films. Standing up and being counted. Here are some of the many ways throughout my life he made me feel free. To be a Black child in a White country is politics, there is no traveling around it. In my teenage years all my heroes had either been killed or died trying to fight for freedom. Here was a man alive prepared to die. Thankfully he didn’t have to. He got out. I was 17 years old. In our family front room that February day we sat in silence as we tried to make out his face. The sun appeared behind his head like a halo. We knew he was just a man and still time seemed to slow down, almost stop. He was an older man to the picture. Of course he was older how foolish, of course he would be… We began to tally the man with the myth. From the moment he spoke I felt free. 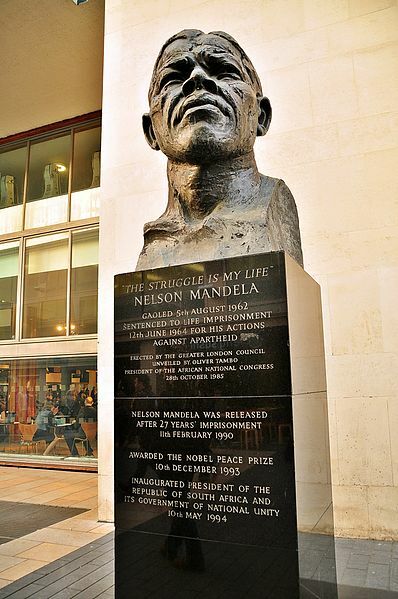 In 1985 my first teenage year I used to visit the bust of his head at The South Bank on a regular. It was sculpted by Ian Walters and commissioned by the Greater London Council. I’d step off the train walk down the steps and stare at his head and think. As I grew older one of the last things I did before I left London to study in Manchester was visit and whisper thank you for helping me understand, for staying strong, for connecting the world against a righteous cause. Thank you for your grace and intelligence and spirit and smile and thank you for dancing. Years later after settling in Yorkshire I was a young mum at home with the baby, it was 2001. We were listening to the radio. They said Mr Mandela will be arriving in Leeds today. I looked at our baby and said ‘Isaac, Mr Mandela is coming to Leeds today’ the baby looked at me then carried on with his stuff. I stared at him and made a decision. I swept him up, packed his bag and buggy and locked up the house. I ran with the buggy to pick up his big brother Reuben from Nursery. I rushed through the gates and banged on the door and came across Mrs Mir Reuben’s nursery Teacher. I said ‘I need to take Reuben out of nursery early. We have to try and see Mr Mandela, he’s coming to Leeds.’ She looked at me and ran to get Reuben. We got his coat. He had a big red puffer jacket which was looked after by a green crocodile on his peg. Mrs Mir waved us off, said good luck and wished she could go with us. There was no time to lose. Reuben and I ran our fastest fastest whilst the baby loved the excitement in his buggy. We ran and ran. Back in those days at Huddersfield Train Station you had to wait to get across the tracks with your buggy! Imagine crossing the tracks with a baby in a push chair and a 4 year old! Thankfully this is no longer the case. We got across the tracks.The train pulled in and we jumped on. We caught the train. I sat Reuben down and tried to explain. We are going to see a very important man. His name Is Mr Mandela. He is important to the world, he was locked up but now he is free. He was President of his country. One day you’ll understand. Reuben nodded his head. He liked running, he liked trains, it was all good. Isaac had fallen asleep, I was sweating and grinning. The train pulled into Leeds. Reuben the baby and me did our racing thing again. We ran and ran. We ran outside Leeds Train Station took a left and left again and saw the crowd at the Queens Hotel. I asked the people there ‘have we missed him? ‘ Someone said no he’s running late. Thank God. I bent down to talk with Isaac telling him not to worry about the crowd. And then the crowd cheered, a car was arriving. I couldn’t believe it. I looked down and grabbed Reuben. I lifted him up on my shoulders and stood holding on to the buggy at the same time. Reuben had a bright red coat, Mr Mandela spotted him in the crowd, our boy, our brown boy. He made his way over to him and shook Reuben’s hand. I said ‘we love you’ and looked down to Isaac and said Isaac Mr Mandela is here! Isaac looked up. And Mr Mandela was gone. We had made it, we had seen him. We made our way over to Millennium Square- Mandela Gardens. No more running just walking and smiling. We bought theA Walk To Freedom CD in the streets. It was a happy day. The boys are now 17 and 14 years old and when I take them to London they still have to go and visit Nelson’s head. Last time we went was when Reuben had completed his GCSE’s. Now we have a world looking for leaders of the calibre of Mr Nelson Mandela who taught us how to be free. It remains a long walk. The journey continues. As a teenager, a young mum, a grown woman. I will be forever thankful for the lessons he taught us for the continued journey ahead. Madiba God Bless you and your memory always.